James Clemens (5-2, 5-0) lost its first two games of the season but now have realled off five region wins in a row. "I was very pleased with our intensity tonight," said Jets head coach Wade Waldrop. "We were playing at a different speed tonight and I didn't anticipate this kind of outcome. All in all we came out heatlhy and we can be locked in on what we need to do." James Clemens has Sparkman and Austin left on their region schedule but want to stay focused and take this one day at a time. James Clemens took the opening kickoff and scored first in the game on a Austin McGhee 5-yard touchdown run and with 9:40 left in the first quarter James Clemens led 6-0. The extra point was blocked. With 5:00 left in the first quarter, Malone scored on a 4-yard touchdown run. Daevion Davis caught a short pass from Jamil Muhammad for the two-point conversion and the Jets took a 14-0 lead midway through the first quarter. After the Jets defense stopped Grissom on a three and out, Xavier McKnight blocked a Grissom punt and recovered it on the Tigers 6-yard line. On first down for the Jets, James Clemens scored on a Muhammad touchdown pass to Chris Hope and with 3:56 left in the first quarter, the Jets led 21-0. After the kickoff, Grissom had the ball and on a 3rd and long while on a bad snap, the ball went in the end zone picked up by the Tigers quarterback and then was sacked in the end zone for a safety. With 2:59 left in the first quarter, the Jets led 23-0. With 11:56 left in the second quarter, Dylan Blackburn scored on a 3-yard run and James Clemens led 29-0. With the Grissom offense having problens to create anything on offense, the Jets offense kept the pressure on. With 9:31 left in the second quarter, Muhammad to Hope combination worked again on a 12-yard touchdown pass play and the Jets led 36-0. 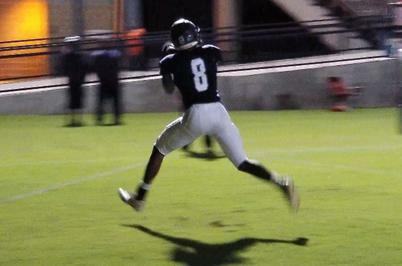 With 2:01 left in the half, Malone scored on a 15-yard touchdown and James Clemens led 43-0. The Jets scored again with two seconds left in the half on a Malone 2-yard touchdown run and the Jets took a 50-0 lead at the half. "We are becoming more electric every game," said the Jets QB Muhammad. "We have found that chemistry, it is becoming easier and easier each week. Since we have been on our streak, we just want to keep it going." The second half started with a running clock and the Jets kept scoring. Dante Snodgrass scored on a 45-yard run and Connor Cantrell scored on a 2-yard touchdown and the Jets led 63-0. Grissom scored with 4:34 left in the game on a Alandris Smith 1-yard touchdown run to put the Tigers on the scoreboard. The Jets defense played lights out all game long holding the Grissom first team to zero points. "We did a great job of playing physical and fast," said Jets defensive lineman Daevion. "We just need to keep executing our game play. Through out the weed we just need to keep focused and keep the young guys ready in case they need to step in and play." James Clemens had 295 yards on 37 carries for a 7.97 yards per carry average. Grissom had 33 yards rushing in the game. For Muhammad, he completed 10-of-15 passing for 154 yards & 2 touchdowns with 97 rushing yards. Blackburn had 72 yards on 8 carries and a touchdown. Total yards in the game, James Clemens had 449 yards to Grissom who had only 133 total yards. Up next, James Clemens will travel to Sparkman while Grissom will host Florence.